Many companies have recently had to adjust to a new economic reality and this has had a knock-on effect on many GIS mapping teams within the property sector, to the extent that many teams' staffing levels were cut back. In many cases this meant that mapping responsibility was handed over to more general, non-specialist staff in an effort to save money leading to mapping needs being somewhat neglected, despite the fact that business, particularly this year, has begun to pick up again. As a consequence of this increased demand, many organisations have adopted FIND's web platform as an effective way to offset recent developments and compensate for their reduced mapping support. Let us know how your doing - we are interested in knowing how departments are coping with their mapping needs. FIND recently launched an exclusive London Building Heights map. 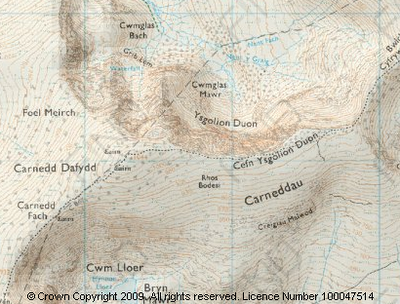 This online map shows buildings with height points superimposed; just like spot heights traditionally shown on walking maps for hills and mountains. But just how accurate is it? The accuracy of the map is unprecedented. In a recent test, One Canada Square, a skyscraper in Canary Wharf, was only 76 cm off its actual height. The building height map shows at a glance the average and maximum height of any London building, its area and volume, complete with the estimated number of residential and commercial floors. 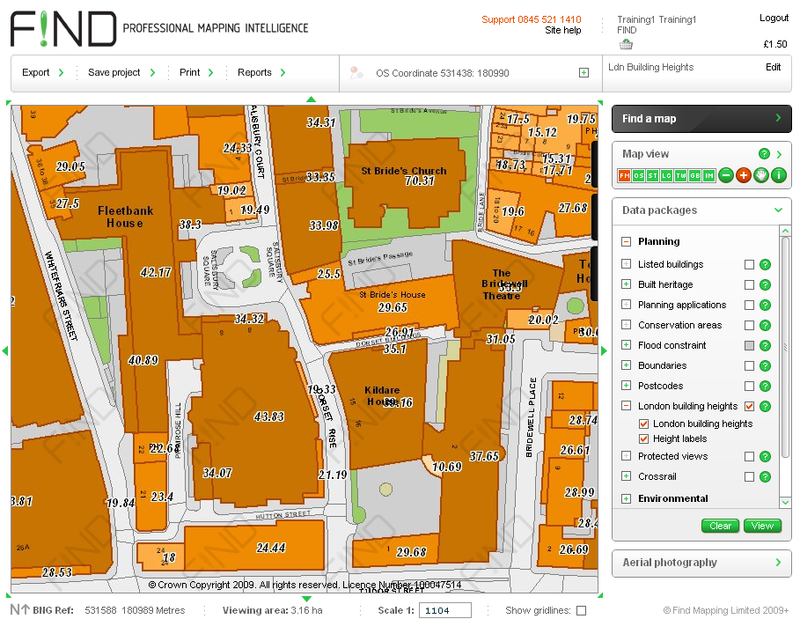 Below, FIND's London Building Height Map: building heights are overlaid over property footprints, with darker orange representing higher buildings. 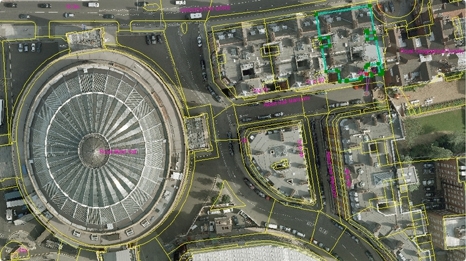 In order to create the most accurate building height map available, FIND used sophisticated modelling techniques to combine some of the highest quality mapping and height survey data in the UK. This map layer can be used for viewing a site within the context of its surrounds, attaching height values to a planning application, or just getting a feel for the surface terrain of an area. Once again our new release pushes the boundaries of mapping innovation and further extends the provision of free mapping. Release highlights include an exclusive London building height map layer, Northern Ireland maps, and several absolutely free maps from the Ordnance Survey. London Building Heights - FIND have combined some of the highest quality mapping and height survey data in the UK to create the most accurate building height map available. This exclusive map shows buildings with height points superimposed; just like spot heights traditionally shown on walking maps for hills and mountains.The accuracy of this map will astound. In a recent test, One Canada Square, a skyscraper in Canary Wharf, was only 76 cm's off its actual height. The building height layer also lists predicted no of floors, area and volume of a building. Northern Ireland mapping - FIND is now one of a select few mapping providers in the UK to offer professional quality maps and datasets from OSNI. Ordnance Survey’s Landform Panorama - From this height data we have created an exclusive and FREE hill-shade layer to really bring to life rural maps ( see image above). We have also made the raw data available to export in a number of CAD and GIS formats. Ordnance Survey Street View - This is a specially designed map for online use - it can be viewed, printed and exported FREE of charge. 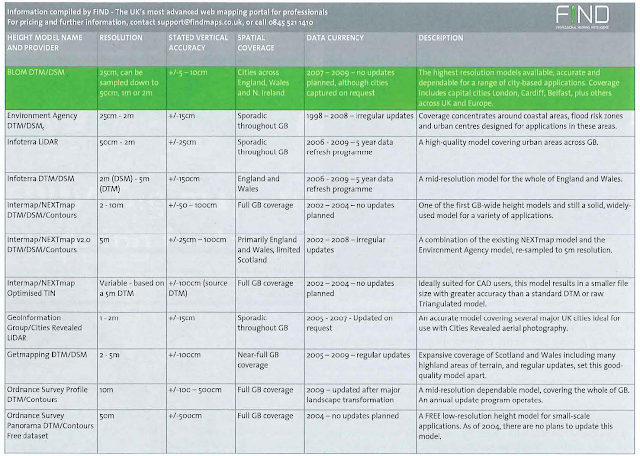 Building on our position as leading independent data providers, FIND has been invited to review data for each issue of GeoConnexion UK. The May/June issue featured all terrain and surface height models available in GB. Different models are suited to different types of projects and project budgets, the table below can be used to identify the right model for your technical requirements or project budget constraints; for example, urban height modeling projects require high-resolution datasets of 1-2 metres or better, whereas national-scale environmental projects often require full coverage at 4-50 meter resolution. The new FIND homepage design and blog went live today, tell us what you think. Welcome to the new FIND blog, which over the coming weeks and months, will discuss all that is new and interesting in the world of FIND, the mapping industry and the world of geotech as a whole. The purpose of this blog is to create a community of not just mapping professionals, but anyone who has an interest in mapping or location based technologies; and discusses the stories and issues of the day in this fast moving sector. More importantly, key data providers read this blog so you can use this blog as a forum to voice your thoughts on the data you use. As always, here at FIND, we will be keeping up with the latest developments in the sector and implementing new ways to interact with the plethora of datasets available. Each new release of the FIND mapping portal adds new functionality and the latest data for your business requirements, so keep checking this blog and the FIND mapping portal for new features as they arrive.